To say I was excited to check in at Wynn Macau would probably be one of the grandest understatements of this relatively young century. With three previous visits to Wynn Las Vegas still sending chills down my spine, my expectations couldn't be higher. Wynn Macau had figured to be the centerpiece of my Macau adventure, and a very large reason why I was here. 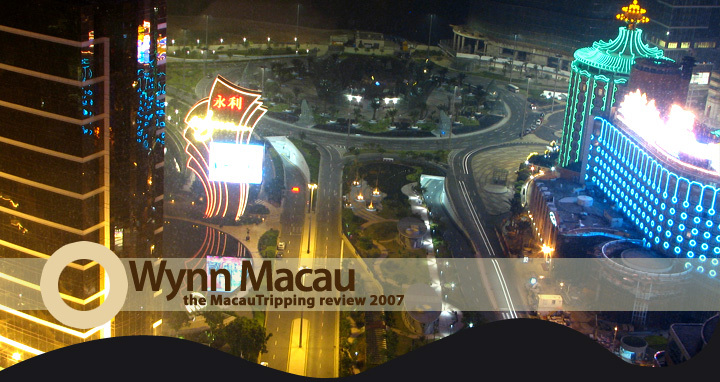 Still, A roving travelogue must attempt to retain some degree of objectivity when setting their sights on a new subject, so I did my best to pack my preconceived opinions and memory based experiences deep inside with a deep full inhalation of Macau's humid air before stepping foot inside Wynn Macau. 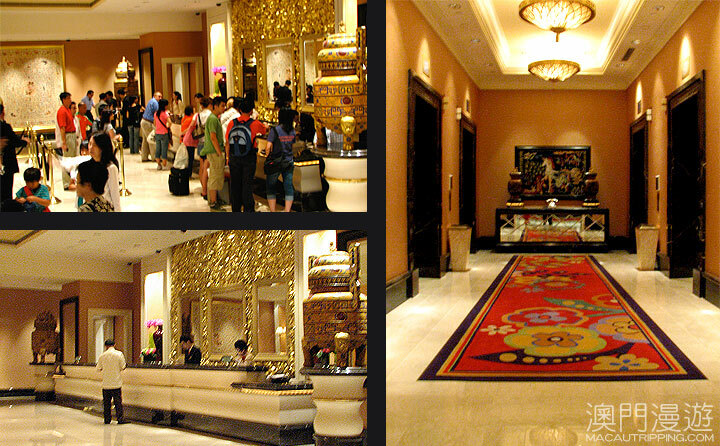 The perfumed lobby at Wynn Macau is a near frenzy of energy during the hours of room turnover. Grand carpeting pads the feet of guests checking in or out and the lucky red chandelier overhead keeps a watchful eye on the many gamblers streaming in towards Wynn Macau's casino. To the immediate left of the entrance is left-luggage and the reception desk (top left). Lines at reception were divided into two sections, guests settling their bills on the right (there is no video check out) and guests checking in on the left. A team of receptionists, including a hands-on manager-type, worked together to expedite the processing of each guest. It wasn't a hurried rush, but a thoroughly organized operation. It is obvious that this well-oiled team has been dealing with high occupancy rates for quite a while. Reception is a ghost town late at night (bottom left). As I approached the counter, an English-fluent bellhop greeted me, mentioned that my room may not be available this early and offered to check my bags in the mean time. His tone and language were tinged with optimistic word choices and positive overtones. It is this anticipatory helpfulness that is the basis of Wynn's service excellence and has personally endeared a number of staff members to me over the years. (Can I give a shoutout to Tsegash at the WLV Drugstore?) He relieved me of my bags and I hopped on the five-deep line at reception. After a relatively short wait, the front desk manager greeted me with a smile, took my passport and credit card, and started poking around the computer system in search of a room. With raised eyebrows, he announced that a great corner room was on the seventh floor was mine all mine and proceeded to finalize all the paperwork. I've seen photos of the corner rooms before, but never stayed in them, how exciting - windows on two walls! After signing all the appropriate documents, the manager gave me the keys and pointed me towards the elevator. As I wheeled around towards left-luggage, I nearly knocked over the bell hop who was already at hand with my bags. We snaked our way out of the crowded reception area, hooked a left towards Cafe Esplanada then took the another left to the resort tower elevator. The familiar sight of the nouveau antique brushed metal house phone on a table at the far end of the elevator vestibule raised a smile to my lips. Sadly missing from the decor are the cylindrical glass vases with stem supported floral displays they have at Wynn Las Vegas. We hopped into the lift, pressed lucky 7 and away we went.